Yeehaww!!! Our Cowbgirl Design is perfect for the cowgirl in your life or for you!! 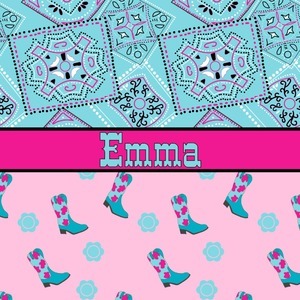 This design has a wild west theme and features a turquoise and pink bandana print on the top half, a pink stripe across the middle, and cowgirl boots and flowers on the bottom. The coordinating design is hot pink, has a turquoise stripe and scalloped circle in the middle, and horseshoes in the background print. Personalize it with name on the main design and an initial on the coordinating design.